If I said, “We’re going to read a book now,” with no particular tonal modulation, no overt show of interest in the book or the reading, no indication that the activity would have a chance of making an impact on me, and no perceptible suggestion of regard for it one way or another, would you be excited to join me? Maybe you enjoy reading books with people, and if that is the case you might look forward to it. However, there’s another way to invite people into shared exploration and learning. Enthusiastically! It’s pretty easy too. All it requires is slightly adapted punctuation and a bit more focus on descriptors. For example, I might have started by asking a question like, “Do you enjoy adventures?” or, “Do quests excite you?” or even, “Have you ever dreamed of embarking on a magical journey?” I might have let the question hover for a moment. I might have allowed a slight grin to develop on my face with a far off look in my eyes as an indication that the thought of an adventure has the power to partially remove me from reality. I might have demonstrated that the same thought uncontrollably catalyzed a departure into my imagination. I might have suggested through my actions that I was excited. After a few seconds of anticipatory wait time I might have followed the question with a couple of statements like, “Have I got an adventure for you?” or, “I love an adventure…and I love the one that unfolds within the pages of this book!” I might have visibly shuttered a if wave of anticipation hit me suddenly, and I might have suggested that we were all in for the ride of our lives. I might have articulated in no uncertain terms that we should all be holing on to our hats in anticipation of what we were about to encounter. Now, if I had taken that tact, I better have had a darn good book in my hands, and I better have been ready to read it well! 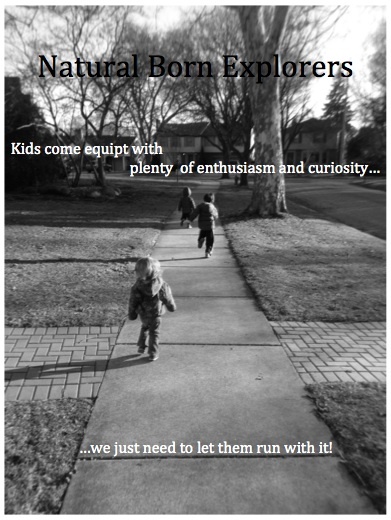 I ponder the idea of enthusiasm for exploration with learning in mind. Specifically, the learning of the children I serve as school and at home. As you know, children are easily excitable. At times, that excitability strikes me as a really good thing. At times it seems overwhelming. The bottom line is that I’ve repeatedly and unequivocally found that the best way to work with the excitability of children is to encourage and support it. If you’re responsible for perpetuating learning and growth in excitable children, one good way to make progress is acquiesce to that excitement. Nurture and guide it with intentionality through your actions and words, but non-the-less, acquiesce. Enthusiasm is fuel for meaningful exploration. Enthusiasm is contagious. Enthusiasm drives forward progress by reminding everyone around it that something is worth being excited about. Moreover, kids come equipped with it! Have you ever seen someone so excited that they almost don’t even know what they’re excited about? That is childhood enthusiasm. It’s built in. It’s a gift to parents and educators. It’s a tool for engagement. It’s a resource that we must not overlook or inadvertently diminish. We have to make sure that children’s sense of wonder and awe is nurtured, even if it seems to be over things that might not inspire wonder and awe in us. Also, it doesn’t hurt to get in on the action. Bathrooms at Sesame Street Live…that is awesome! When we affirm children’s enthusiasm for exploration over anything we perpetuate their innate leaning for exploring in general. In doing so we help to enhance their understanding of, and love for learning! Seth I love this! It is amazing how kids come to us to so innately enthusiastic. We need to do everything we can to help them maintain this. I love your enthusiasm for enthusiasm, I think that is why certain actors and public figures are so convincing. Their enthusiasm is contagious. We must make every effort to replicate this for our kids. Better yet, we must get them to teach us.